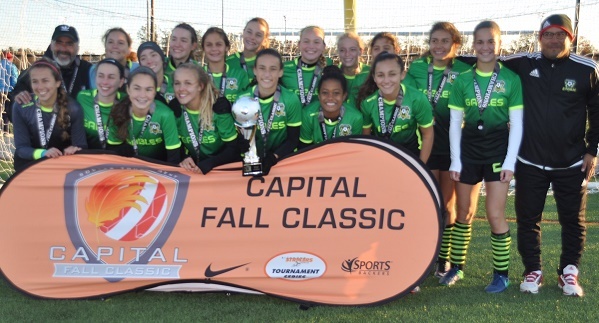 A total of 33 teams representing 26 clubs won division championships on Sunday at the Capital Fall Classic Girls Weekend, the second and final leg of the Richmond Strikers Tournament Series’ end-of-season event. The eclectic group of division champion teams were from seven different states, in one of the tournament’s widest-reaching editions to date. In addition to 20 Virginia sides winning their groups, others representing Florida, Maryland, New York, North Carolina, Pennsylvania and West Virginia did the same. 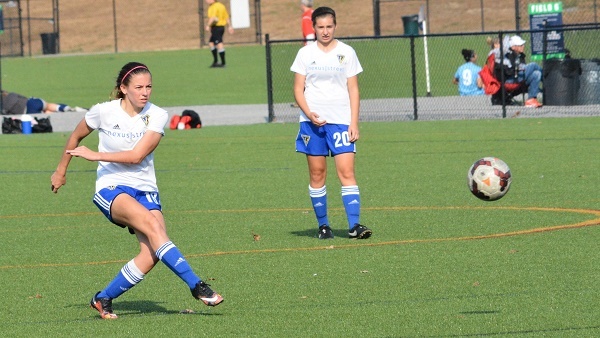 Fredericksburg FC, St. Mary’s Soccer, Virginia Soccer Association and Virginia Rush each had two teams earn first place finishes, as host club Richmond Strikers led the way with three. Champions of 11 Premier Divisions also earned guaranteed acceptance into the 2017 Jefferson Cup, one of the nation’s most exclusive showcase tournaments. Gunston SC ’07 Red swept the competition in the U-10 Premier Division, posting a perfect 4-0-0 record while outscoring opponents 13-3. At the U-11 level, Richmond Strikers ’06 Elite earned Jefferson Cup qualification with an unbeaten 3-0-1 run through the Premier Division, notching a 9-2 goal differential. Maryland side Lutherville-Timonium SC ’05 Strikers Purple advanced through Group B of the U-12 Premier Division with a pair of clean sheet wins, before going on to defeat Old Line FC 2-1 in the semifinals and Jacksonville ’05 Coastal Surge Black 8-3 in the title match. The U-13 Premier Division saw Herndon Youth Soccer Crush ’04 qualify for the Jeff Cup via four consecutive victories. After earning a pair of hard fought 2-1 wins in Group A, Herndon shut out Richmond Strikers ’04 Elite 1-0 in the semifinals before going on to blank Commonwealth Futbol Black ’04 by a 2-0 score in the final. Virginia Rush ’03 posted an unbeaten 2-0-1 record to finish atop Group B in the U-14 Premier Division, advancing to the final where Rush picked up a 1-0 clean sheet victory over New River United 03. Another Virginia Rush squad, the ’01 Girls, placed first in the closely-contested U-16 Premier Orange Division, edging Ohio’s Soccer Vision Academy on goal differential after the teams tied with undefeated 3-0-1 records. Pennsylvania side Vincent United F.C. ’02 Integrity stormed through Group B of the U-15 Premier Division with three straight wins, outscoring the competition by a margin of 15-3. Vincent United secured its place in the 2017 Jefferson Cup on Sunday by shutting out Richmond Strikers ’02 Elite 1-0 in the title match. New York’s Empire United Rochester ’01 steamrolled its way to four straight wins, culminating with a defiant 3-0 shutout of Richmond Strikers 01 Elite in the final. Empire United cruised to three wins in Group B on its way to the final, outscoring its group opponents by a total of 15-1. Florida team Coral Gables Soccer Storm ’00 did not allow a single goal over the course of four wins, claiming the U-17 Premier Division trophy. Coral Gables scored nine goals during three Group A matches, and came out on top 1-0 in a defensive battle against Northern Virginia side SCAA Elite 00 in the final. In a U-18 women’s age group loaded with quality teams, Pennsylvania side North Union United ’99 Lady Cannons and Virginia’s Arlington ’99 White claimed the Premier Orange and Premier Black Division championships, respectively. North Union United powered through Group A of the Premier Orange Division with three straight wins, racking up 13 goals and only allowing one before defeating FC Richmond Mystx 3-0 in the title match. Arlington ’99 White came out on top of the five-team Premier Black Division which featured a showcase format, earning two wins and two draws. The tough Arlington defense conceded just one goal over the course of the four matches, playing in one of the most competitive divisions as all five teams secured at least one win. See below for the list of division champions and finalists from the Girls Weekend.